Creamy chocolate cheesecake is so chocolaty and yummy that you will enjoy last little morsel. Don’t look at calories, just enjoy it with your heart. 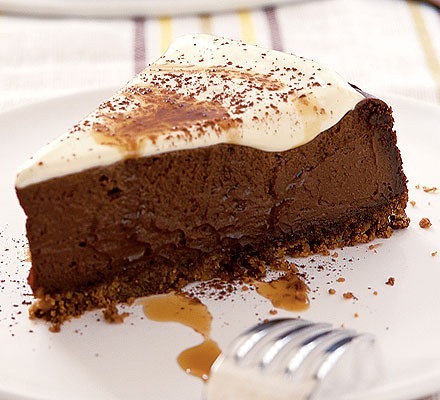 The creamy topping adds a delicious tang to the indulgent filling. Whizz the biscuits in a food processor to make crumbs. Add the melted butter and mix it well. Press into a greased pan and chill it in a refrigerator. Heat oven to mark 140. Beat the cream cheese, mascarpone, corn flour, caster sugar, vanilla, and eggs until smooth and thick. Stir in the melted chocolate until combined. Pour into the tin and bake for 1 hour or until its firm. Leave to cool. For the topping, mix the sour cream with the sugar and vanilla paste. Pour onto cheesecake and bake for further 10 minutes. Transfer it to a fridge, then cool and dust with cocoa powder.